However, there is a way to effectively balance patient care requirements while managing cost of service delivery within budgetary expectations: Adopt a functional patient acuity and workload process. Download today to learn practical talking points for implementing a functional acuity and workload process so your department or facility can begin to see improved outcomes! 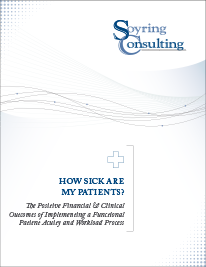 Soyring Consulting provides clinical and managerial consulting services to healthcare facilities of all sizes, including Investor-owned, Not-for-profit, Community, University, and Faith-based facilities and systems. Our team has worked in more than 35 states across the United States in all areas, including surgical services, sterile processing, hospital and facility design, nursing/clinical units, and others. By combining our experience, proven knowledge, and time-tested skills, we work with your team to create targeted opportunities, along with the plan and achievable goals to get to them.